There are some people who continue to impact the world long beyond their days here. Vic McClung was such a person. ALS stole him away from his family, friends and community too soon. Gone now two years, he is hardly forgotten. This Memorial Day post is dedicated to Vic, with love for his family. 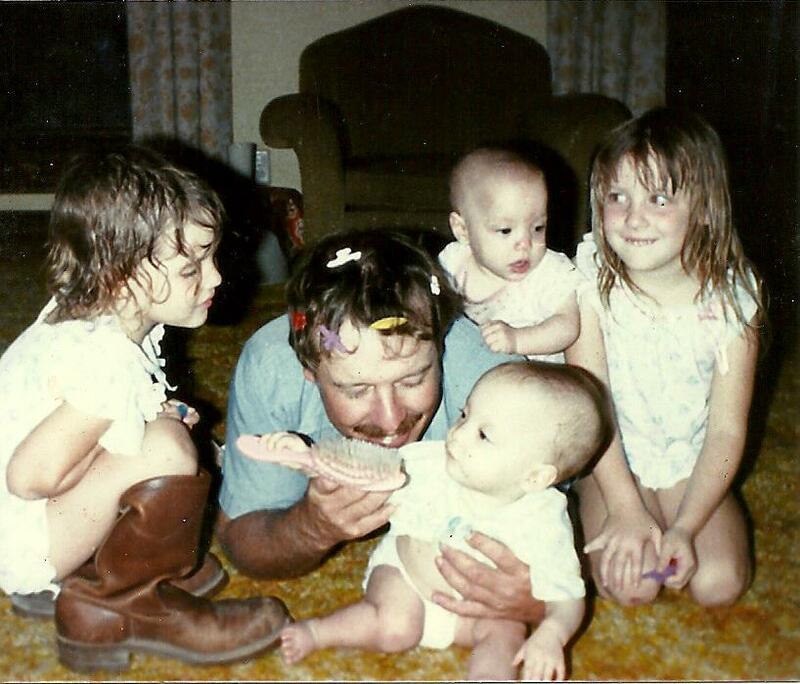 Vic with his four beautiful daughters. Photo courtesy of Allison Hughes. What kind of man was Vic McClung? He was a listening man. Never himself one of many words, Vic listened carefully whenever others spoke or provided answers to his thoughtful questions. A perceptive man. Not prone to jump on anyone’s bandwagon, Vic preferred to study all sides of an issue. When he did offer his unique insights, they often lent fresh perspective to a divisive situation. A fun-loving man. He enthusiastically supported, planned and hosted various social get-togethers for his church group, as I’m sure he must have for other groups to which he belonged. We enjoyed holiday parties, picnics at his house, a hay-rack ride to tour significant locations in the western part of the county, and a delightful afternoon at the Eastman cabin overlooking a bend in the Walnut River. Vic McClung was a quiet man. Yet when he did express himself the words were filled with insight. He could even communicate without words. He made you feel valued and needed with nothing more than a glance in your direction accompanied by a little smile. He was a hugging man, and was quick to bestow bearhugs on young and old alike. Vic was a welcoming man. He made a point to greet all who participated in the ALS walk on his “Strangers on Tractors” team. He and Jan greeted every guest at the reception for his daughter’s wedding. He made each person in our adult New Beginnings class feel important and needed. A caring man. Often Vic’s questions delved into a personal nature that would let you know he cared about you and your family, but in an unassuming way. The concern he showed others, however, was dwarfed by his love and dedication to his family. With intent, he searched for ways to help Jan and the girls adjust to a world without him in it. Though faced with incredible challenges personally, his greatest concern was for the well-being of his family. A giving man. Vic’s caring nature was not more evident than in his generosity. From serving as video photographer at various of our family’s celebrations, to loaning a stock trailer so we could move a grand piano to an outdoor stage, to helping extricate Walnut Valley festival campers from the campgrounds as the river rose one year, to donating pumpkins from the McClung pumpkin patch for a Halloween youth party, to leading our church group in numerous projects like helping folks move from one home to another, sponsoring dinners to raise money for missions, and donating the meat for such fundraiser events. The list of McClung generosity goes on and on, to the very last donation of his body to research that would benefit others struggling with ALS. In short, Vic McClung was a cultivator. He was able to transfer his passion for raising healthy crops and livestock into other areas of life. He cultivated a wonderful, loving family. He cultivated friendships. In his own words, he “cultivated his thought processes” as his questioning led to a deeper understanding of our world. He nurtured the many groups he served, encouraging each of us in those groups to become better people. Vic was a cultivator. It was a great honor to call this man a friend. His gentle leadership will always be remembered. What is a Piano Lesson? What a moving tribute, sure to be treasured by his family. Thank you Ann! This was moving on the day of the service and movingtoday. It is wonderful to remember the man he was and to think about all the good he did in the world! Thank you for putting all our feelings into words. Ann – Thanks so much for sharing this. We are truly blessed to have you and your family in our lives. It’s an honor to have Vic’s family respond, Erin and Shannon. You actively carry on the tradition your folks started and make the world a better place. Thanks for sharing the photo. Stumbled upon the story on Vic after reading another about “Lester”(still reeling from that.) Am taken by the photo of Vic on the floor with his four girls. Especially the one in the boots. If the meaning of life has ever been a question- that picture sums it up. Well done Vic! Hats off to the little bald headed girl too!